For all my local readers out there, thanks for holding on. Early August I experienced an issue with this site and WordPress: the publish button disappeared from every menu. Where Publish should be there appeared Submit for Review, and the Preview button was also gone from the top right. Since this site is a one person experience I checked my users and saw that I was the only login and was, in fact, an administrator for WordPress. OK, so I made another user and promoted them to administrator but the same thing. 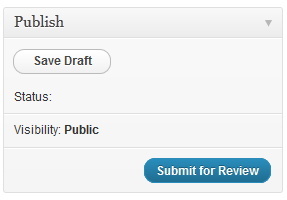 Clicking Submit for Review didn’t do anything. Then I hit the internet and searches revealed others having the same problem but no solutions other than starting fresh. That seemed like a lot of work so I held off. A few months passed as I kept busy being Editor-In-Chief of Comic Book Daily, taking a few trips and generally dreading doing a complete re-installation of this website. Eventually I gave in and exported my site, copied wp-content and started fresh. Since it was new I dropped the sub-domains and left them as categories. As well decided on a fresh theme, and here we are. I haven’t discovered a fix for this issue but would love to hear of one so please comment if you’ve triumphed.